Fujifilm has launched two new superzoom compact cameras boasting up to 20x optical zoom capability in a slim body. 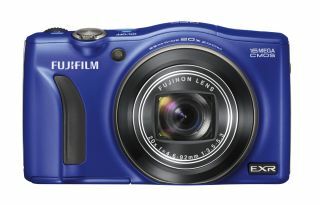 The first camera, the F770EXR features a 16 million pixel EXR-CMOS sensor coupled with a 20x zoom lens. In addition, it also includes enhanced GPS functionality in a pocket sized body. The EXR-CMOS sensor within the camera has been enhanced, with EXR Auto automatically optimising settings according to scene types and which has now been expanded to offer 103 different shooting patterns to push the camera's low-light capabilities. Fuji has re-shaped the photo diodes on the sensor, which it claims results in a 30% reduction in digital noise over the previous version when using high ISO settings. With its 20x optical zoom, the F770 is the smallest camera shell in the world to include such a zoom range. With 25-500mm (35mm equivalent), the wide zoom range capability is due to the newly designed Double Sliding Lens System which features two additional lens elements within the optical construction. Intelligent Digital Zoom can also be found on the camera to effectively double the focal range, thus making an effective maximum telephoto setting of 1000mm. The camera has been optimised for fast start up, while shot-to-shot times have also been decreased along with the AF speed. Working with the GPS tracker, the camera features a Landmark Navigator feature, which indicates nearby landmarks and their distance. When pointed towards the ground, the LCD converts to a radar view to show locations relative to where the user is standing. The F770EXR also allows photographers to be creative, with raw format shooting being possible along with a number of advanced exposure modes such as aperture and shutter priority as well as manual and program. Full HD video recording at 1080p at 30fps and stereo sound is also available. Meanwhile, the F660EXR has also been announced, featuring a 16 million pixel EXR-CMOS sensor and 15x optical zoom lens. The 1/2 inch sensor has an ISO sensitivity range expandable up to 12800, while the same redesign of the sensor as the F770 also claims to reduce digital noise by 30%. The F660 also includes 1080p Full HD video recording, face tracking and a full complement of manual exposure modes and raw file capture. UK price and availability for both the F770 and F660 are not yet known.